HomeHeadlinesSpecial Olympics hero Lee aims for more gold medals! Special Olympics hero Lee aims for more gold medals! LEE Mitchell was the toast of Omagh last Friday evening when he made a triumphant return home after winning two gold medals at the Special Olympic World Games in Abu Dhabi. The popular 21-year-old Omagh Spires member represented Team Ireland and struck gold in both the English Equitation and Working Trial equestrian events. It was the experience of a lifetime for Lee who told the Ulster Herald that he “loved every minute”. Lee has been horse-riding for eight years and initially thought it was “very cool” to be selected for the Ireland team. He began his training in September 2018, attending weekly training sessions with his club coach Conall Kelly at The Yard as well as making frequent trips to Dublin where he spent time with the 90 other athletes taking part in the games. Dedicated Lee certainly put in the work before heading off to Abu Dhabi and it paid off in style once the games started. Lee had to get up at 6.30am each day and then compete in front of thousands of people on an unfamiliar horse. However, he took this all in his stride and quickly developed a bond with his horse ‘Cocoa’ – the rest is history as the duo went on to win in both categories. Arriving back home to Omagh in real superstar fashion on board a fire engine last Friday evening, the 21-year-old was greeted by a sea of people excited to see his gold medals. It was then a quick transport change for Lee who moved onto a horse and cart for a victory lap around the town, receiving cheers from his huge support base along the way. “I loved every minute of it,” he said. 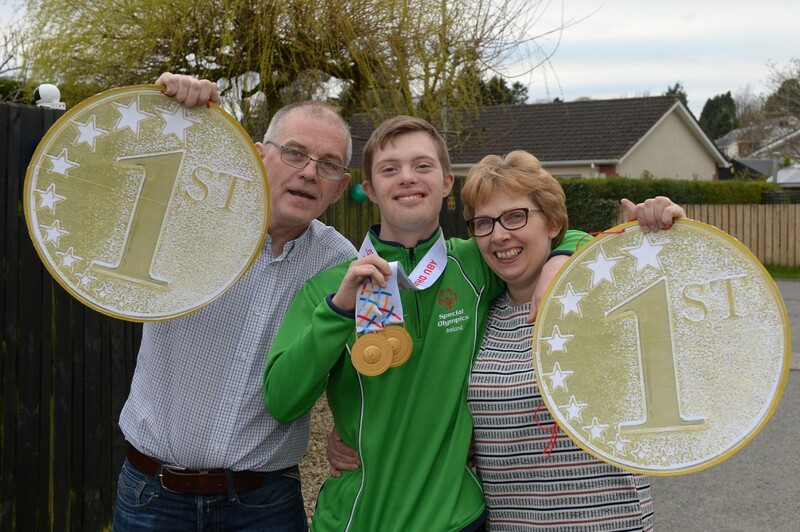 Having ticked off winning Olympic Gold in Equestrian from his to-do list, Lee has set himself a new goal and hopes to represent Team Ireland in the swimming event in the 2023 Special Olympic World Games in Germany. Swimming is Lee’s favourite sport and he’s determined to take Gold in the Butterfly discipline. So watch this space, this is certainly not the last we’ve seen of Omagh athlete Lee Mitchell!